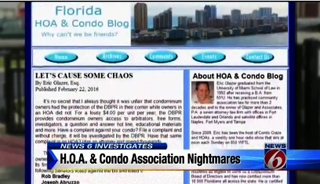 A News 6 investigation has found HOA and condo association residents may be facing the same issues of alleged mismanagement but only condo association members are getting state assistance to hold board officers accountable. 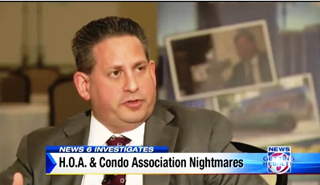 Eric Glazer an expert in community association law and radio host of Condo Craze and HOAs, says allegations of mismanagement, sleeping security guards and broken entrance gates are the stuff of HOA and Condo complaints. “We hear horror stories like that," Glazer says, “We hear horror stories of boards stealing money and unfortunately at least over the past year or so it’s reached near epidemic proportions." On Monday the veteran community association attorney filed a BLOG essentially blasting state lawmakers for rejecting a plan that would have provided HOA residents the same free assistance and investigative services from the Department of Business and Professional Regulation already offered to condominium residents. “For whatever reason the Florida legislature thinks it’s a bad idea to charge HOA owners a lousy two bucks per year for them (HOA residents) to get the same help." 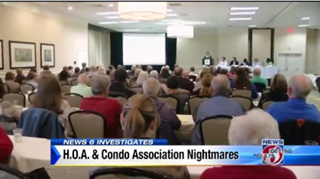 Glazer has already certified 11,000 community board members anxious to learn state law and avoid the legal battles that go with HOA and Condo Association mistakes. Glazer says the DPBR does ”a tremendous amount of work” for condominium association residents including arbitrators, question and answer hotlines, free online forms and investigators to review resident complaints. The cost of that service is just $4 per unit every year. One of the most unsettling cases involving alleged mismanagement happened last November when Mary Haigh was carjacked at gunpoint just 200 feet from her front door. The mother of two was sitting in her car talking to a relative when according to Orlando police a teen held a loaded handgun to her head. Ironically the gate had been broken for weeks and was wide open when the teens walked in and drove away with her car. “All I could think about was my kids…was I going to get shot, was I going die?…” she said. The teens involved were arrested but Haigh and her family have decided to leave the Orlando area. Haigh says the condo association gave her an apology- nothing else.